Also known as Gajar, Carrots have a long, narrow, cylindrical cone shape root, but they are also found in other varieties that may be thick and short in shape, or that are orange, red, purple, yellow, or white in color. 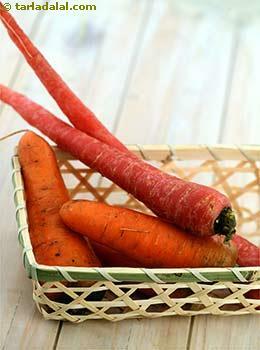 The carrot has a sweet flavor and is one of the most popular versatile root vegetables. Carrot roots have a crunchy texture with a sweet and minty aromatic taste, while the greens are fresh tasting and slightly bitter. The glycemic index of carrot is 71 and the glycemic load is 7.5. Is carrot safe for Diabetics? The glycemic index of carrot is 71 which makes it high GI vegetable. Since 1 medium sized carrot contains 10.6 grams of carbohydrates and makes the glycemic load of 7.5, it is safe for diabetics to consume carrots. However, eat them in moderation to avoid the instant raise in blood sugar levels. Diabetics should limit their carbs intake by 45 to 60 grams per meal to keep the blood sugar level stable. Remember the more you cook, the GI of the food items increases. Thus consume carrots in its raw form as a salad. Even if you have carrot in its cooked form, combine it with foods low in GI to minimize the overall effect of the meal. The fiber content in carrot (4.4 grams in 1 medium sized raw carrot) slows down the absorption of nutrients in the bloodstream. Hence contributes in keeping the blood glucose levels stable. Also helps in lowering your cholesterol levels. It is extremely a rich source of fat soluble vitamin A which helps in insulin release and also improves your vision. Is carrot suitable for weight loss? 1 medium sized carrot provides around 50 calories. Thus proves to be an ideal option in the calorie restricted diet. It is important to burn more calories than to consume. Fruits and vegetables plays a vital role to get better results in the weight loss plan, as most of them are low in calories and high in fiber. Fiber further adds benefits in the weight loss diet. This is because fiber remains undigested, forms a gel like substance in the gut. This gel slows down the emptying of the stomach and increases the time taken to digest and absorb nutrients. Thus reduces your appetite and overall food intake.